Choose materials and finishes that are not slippery when wet. 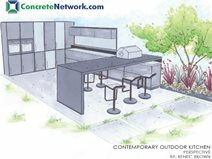 Concrete finishes, like stamped concrete, washed aggregate, or salt finished concrete are often my first choices in outdoor kitchen flooring because of their affordability, durability and endless versatility. 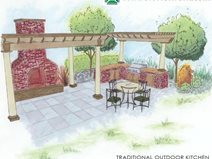 Style Tip: Choose outdoor kitchen flooring to accent other materials already used on site or indoors. 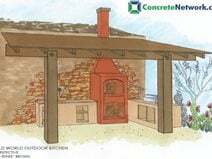 Use of a similar flooring material that is complementary, but different than everywhere else on the property will help to better define the "outdoor room" feel of the barbeque area. Use of steps to create height variations also enhances the separate room feel. 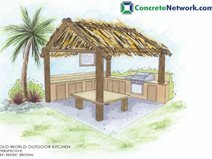 Outdoor Kitchen Flooring Style Match-UpsWhat style is your backyard? 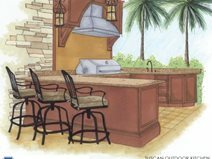 Consider these style match-ups from expert garden designer, Scott Cohen when choosing flooring materials for your outdoor kitchen. Slate or cast-concrete tiles designed to be outdoors or clean, washed concrete in integral colors. 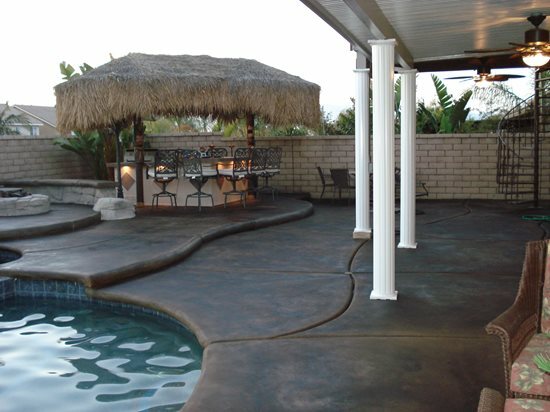 Tumbled pavers, unhoned travertine, deep-washed exposed aggregate or stone-texture stamped concrete. Brick or darker flagstones, washed concrete or stamped cobblestone concrete. Flagstone or faux rock texture-stamped concrete with stain accents. TIP! Choosing a stamped concrete patternAppearance aside, take a couple of practical steps to make sure your outdoor floor lasts a long, long time. Select a stamp pattern that's not too deep to drain or to allow you to set outdoor furniture level on top of it. Be sure to apply a good-quality penetrating sealer around any floor that's in the cooking or dining areas to protect your flooring from oil and wine spills.